In eleven languages, no less. For three days we’ve tried walking in, walking round then walking out, and to be blunt our knees are starting to feel as though we’ve been walking on cobbles a lot. Today using what was left of our “twenty-four hour unlimited rides for three people” ticket, we took the tram to town, wandered around just enough to get us to a place where we could sit and be shown as opposed to wandering and discovering. 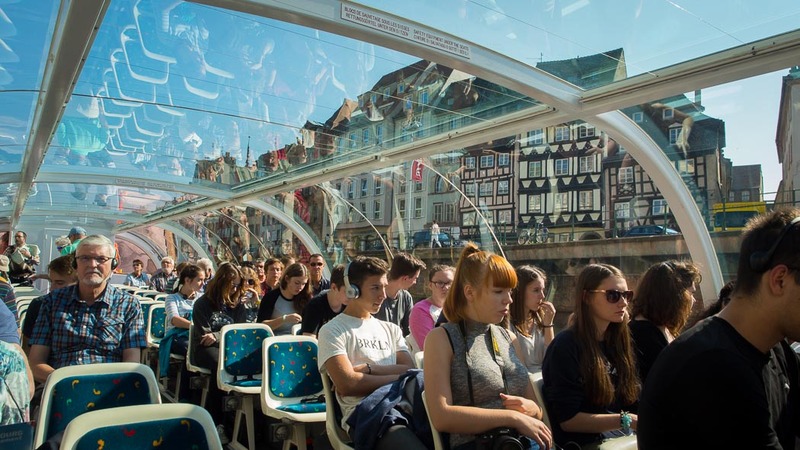 It’s almost a decade since we’ve been on one of the “See Strasbourg by boat with commentary in eleven languages” kinds of tours, and while we weren’t terribly concerned that we’d forgotten any of the interesting and obscure historical anecdotes gleaned on that excursion, we felt a refresher could do no harm. Particularly as it meant sitting for an hour and a half while we did so. At the end of it all we were so refreshed with heads so full of spinning factoids and jolly good time that we were half way home by the time we realised we hadn’t had lunch, and that would never do.